Texas Governor Rick Perry’s greeting to the NRA Convention, April 29, 2011. About two months before Rick Perry announced his presidential candidacy, he was a star draw at a Houston luncheon where the National Rifle Association was hunting for big bucks and touting its political clout. The May 26 bash at the swank Coronado Club drew dozens of rich gun aficionados and longtime Perry mega donors, according to two attendees. NRA executive vice president Wayne LaPierre gave an impassioned talk about gun rights that included an update on the NRA’s vaunted grassroots get out the vote operations which can sway tough elections. Perry, too, spoke ardently about gun rights and several other national issues, prompting one attendee to wonder if Perry was running for president. The luncheon may yield dividends for Perry as well as the NRA. It attracted several Texans who have since become major fundraisers for Perry’s campaign including business executive Roy Bailey and energy mogul Clayton Williams. Williams told the gathering that his company gave $1 million to the NRA’s Freedom Action Foundation in 2010 and would do so again in 2012. On the first of this month, Williams then hosted a fundraiser at his Midland, Texas, home for Perry’s presidential campaign. The event drew about 400 guests. Perry’s close ties to the 4 million-member NRA could yield more political benefits. Last year Perry got the NRA’s coveted endorsement for his re-election and an A-plus rating. The NRA also reported making independent expenditures of $526,706—including mailings, calls, radio and TV—to support Perry’s re-election, according to the National Institute on Money in State Politics. Perry has signed into law numerous gun-friendly bills, some of which have drawn fire from business interests and law enforcement officials. The Texan has boosted his pro-gun stature in other ways. Perry talks proudly of shooting a coyote while he was jogging because it threatened his daughter’s dog. 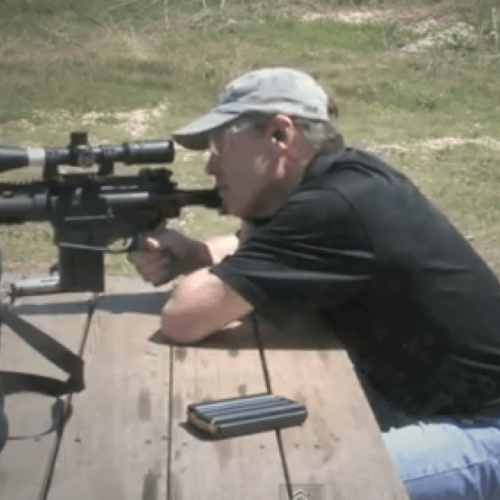 And this year Perry sent a video greeting to the NRA’s annual convention showing him firing away at a rifle range. “As a lifetime member of the NRA, a strong proponent of right-to-carry laws and a believer in the notion that gun control is hitting what you’re aiming at, I want to encourage you to keep up your great work,” Perry declared in his video message. Earlier this year Perry signed a measure that took four years to enact over strong business objections. It allows gun owners to keep their weapons and ammo in their locked cars at workplaces. “He’s been very supportive of gun rights, hunting rights and self-defense issues that are very important to our members and supporters,” NRA spokesman Andrew Arulanandam told iWatch News. Perry could be a contender for an NRA endorsement during the presidential primary season, a step that the gun group took only once before. In 2008, the NRA backed Bill Richardson in the Democratic primaries. Since he became governor, Perry has signed 17 gun bills that the NRA backed, according to Brian Malte, the director of state affairs for the Brady Campaign to Prevent Gun Violence. In his book Fed Up, Perry slammed Congress for overstepping its authority when it passed the landmark federal gun control law which barred felons and mentally ill individuals from purchasing and possessing firearms. Perry’s attendance at the May luncheon was warmly received, but the group declined to provide details about how much money was raised at the luncheon or at a cocktail reception that evening in Austin. “We were grateful to have the governor of Texas talk to our members and other like minded people in his state,” Arulanandam said. On Sept. 1, the workplace gun law went into effect despite controversy and concern. The bill’s chief sponsor, Texas Sen. Glenn Hegar, told iWatch News that he never sought Perry’s backing because he didn’t need to. “He’s supportive of Second Amendment rights and I’d never expect otherwise,” Hegar said. The bill was opposed by many companies in Texas. It pitted the NRA and the Texas Rifle Association against the Texas Association of Business, which spearheaded a broad coalition that argued that the bill infringed on property rights and could spark violence. Bill Hammond, president of the Texas business group, said the group wrote to Perry and asked for a veto but to no avail. “We certainly hope that no tragedies occur as a result of this legislation, but we’ll remain watchful,” Hammond said in an interview. Separately, in 2005 Perry signed a bill that weakened Texas’ existing concealed handgun licensing provisions, prompting concerns among police officials. The measure said it was no longer necessary for a driver to have a permit if there was a loaded weapon in the car. The bill “makes it more difficult for law enforcement to capture or disarm anyone who might be a criminal,” Malte said. Perry has also drawn criticism for advocating that students and faculty can carry loaded guns on campus if they have concealed handgun licenses in Texas. The state legislature has turned this down twice in 2009 and 2011 despite Perry’s advocacy. “We think this is far outside the mainstream,” Malte said, adding that Utah is the only state to have authorized carrying on campus at its public universities.